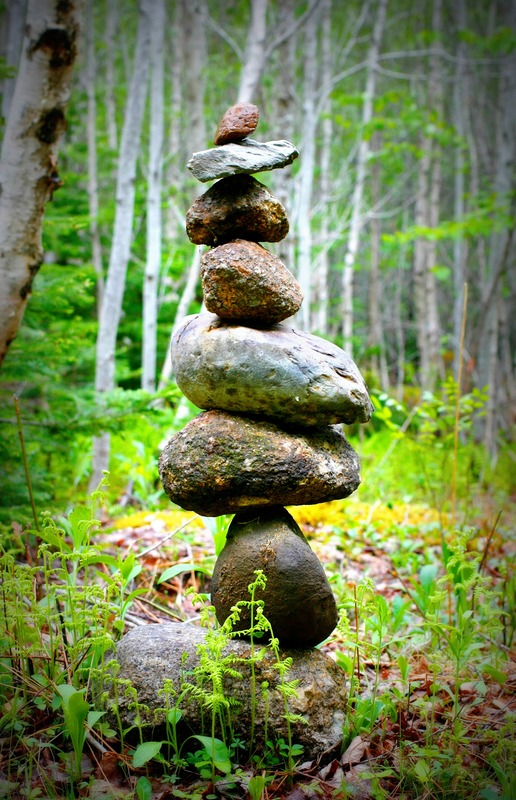 Playing With Rocks ~ Lessons in Balance, Presence, and Coaching. It’s been a while since I have blogged. 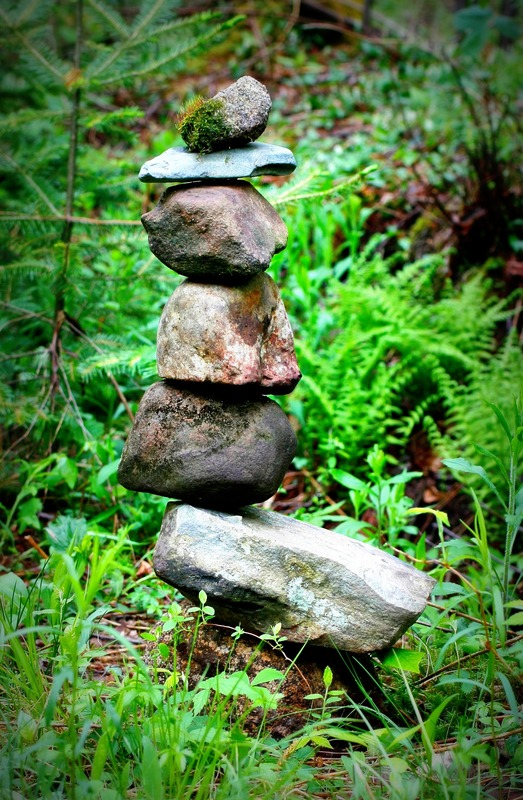 I have been busy building things….my coaching practice, my now 80-day-old doodling practice (for that you’ll have to check out my Facebook page…the doodles of “Mary Doodle, Rural Life Coach” are publicly viewable there), and I’ve also been building rock piles. But only small ones so far. It started with a post on Facebook shared by my own coach, the inimitable Richard Morgan, (were I to have to explain what he does in a coaching session I could not…it is magical and mysterious.) 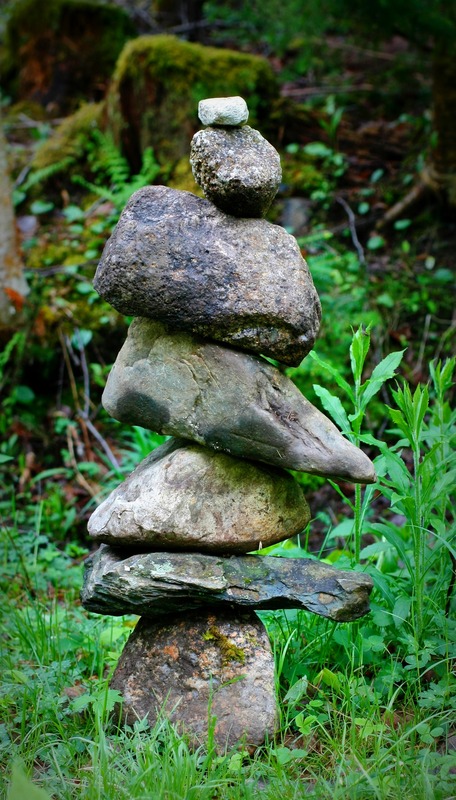 He shared a post of a video of a guy who was building small structures out of stones in rivers and streams, fascinating balancing stones making beautiful arches and delicate piles. I only watched it once. 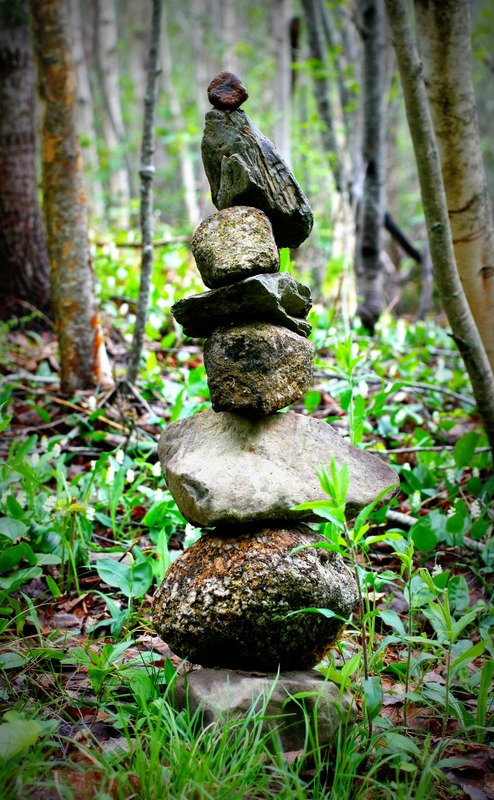 And then the next time I was walking my dogs in the woods here, I started hauling rocks onto the edge of the trail from the ditch or underbrush and started making little stone stacks, a couple feet high at most, just vertical, no arches so far. I hadn’t really paid much attention to the video so I couldn’t recall what his looked like just that it looked fun. So in a week or so of dog walks I had created about 8. I think I have 15 now, although a couple keep falling over. 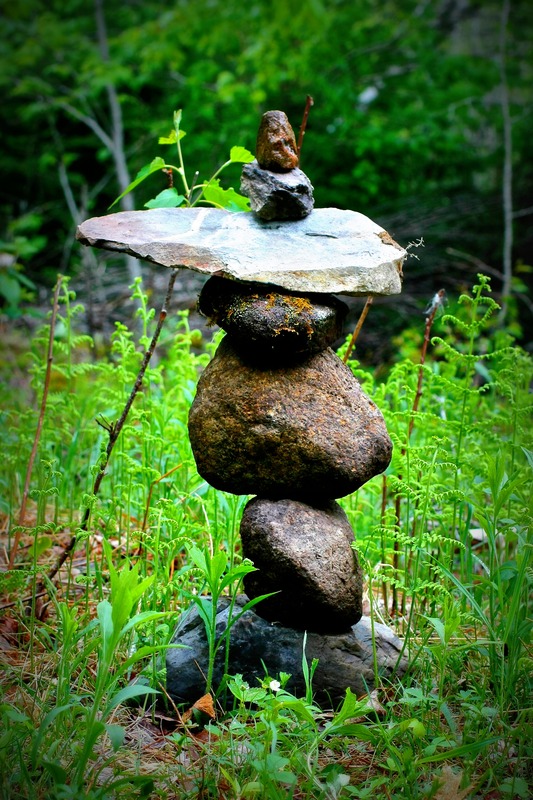 And unlike the fellow in the video whose name turns out to be Michael Grab and his web site is all about this rock balancing project of his, I had no awareness of how he was doing it or how I should or could do it. (You can read about his technique on his site.) 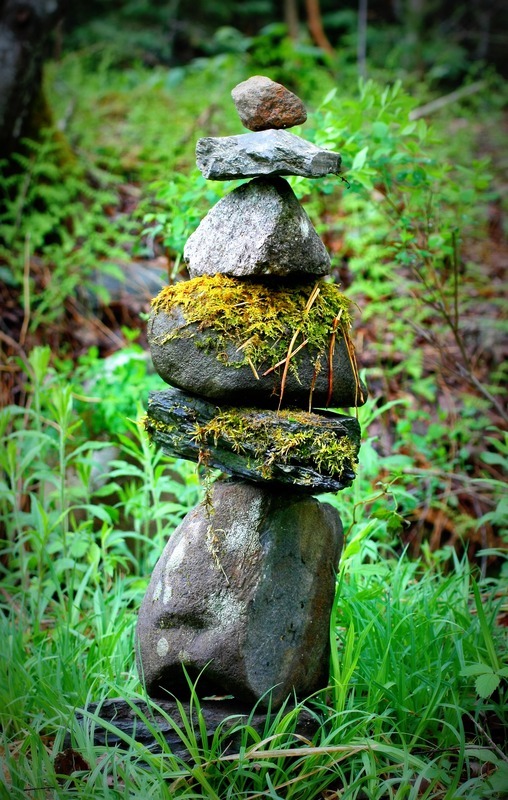 I was just seeing if I could make a vertical pile and how high, with whatever I found in the vicinity. No pre-planning. No understanding of how that guy did it. Totally random. And it taught me a few things, and these things that I needed to make these stacks were things that I realized I also need as a good coach. 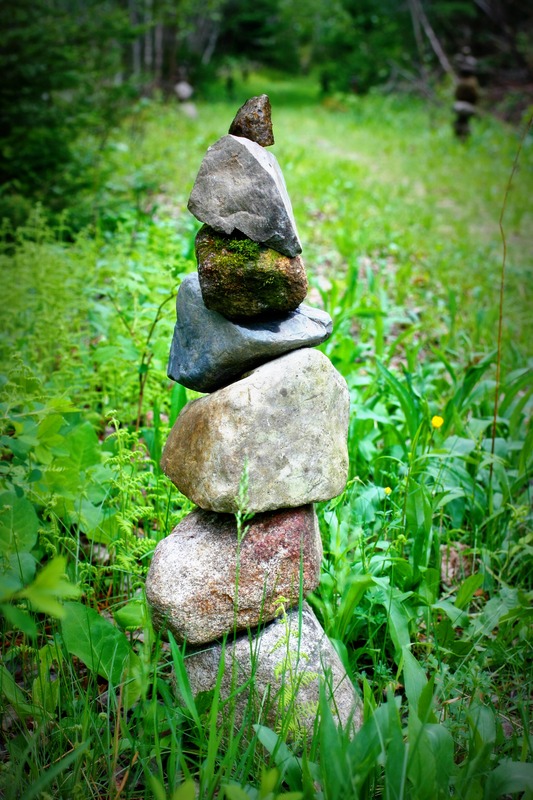 Creating the stone stacks became metaphors for life coaching. And if you have the patience to take a slow (very slow) and meditative walk with me (17 minutes in total.…painfully slow for some in this era of sound bites, quite relaxing and peaceful for others), then I invite you to watch this video I made about it which tells you about my discoveries as they apply to coaching. I understand I was a Franciscan monk in a past life. I think in some ways I still am in this life. Get out of your mind. Stop trying to think your way through everything. Allow your intuition to guide you, and see what flows. Things often become easier and more effortless if you just stop over-thinking and get out of your own way. You can’t really plan or force something like this. Be totally present and in the moment. 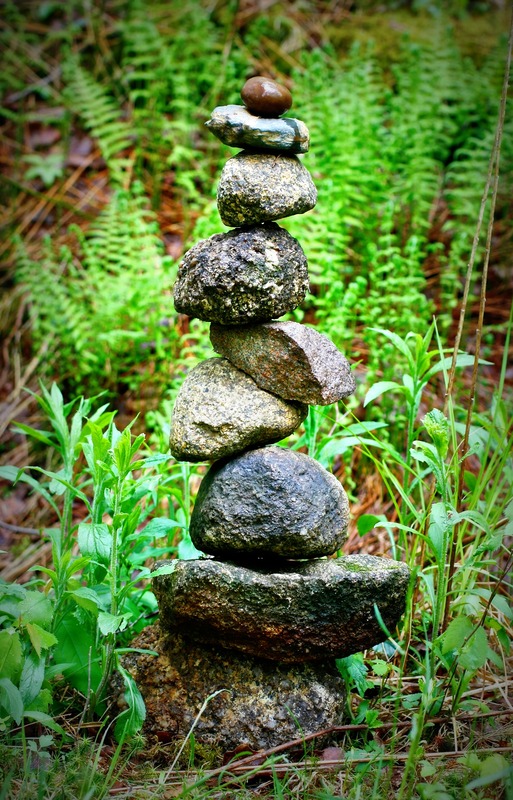 You cannot balance the odd shapes and sizes if you are not fully present to what you are doing. Likewise, you cannot hear your client and what’s really being said if your mind is in a dozen places. Likewise, the client must be fully present and “in the room”. If not, do some grounding exercise to get them there with you. 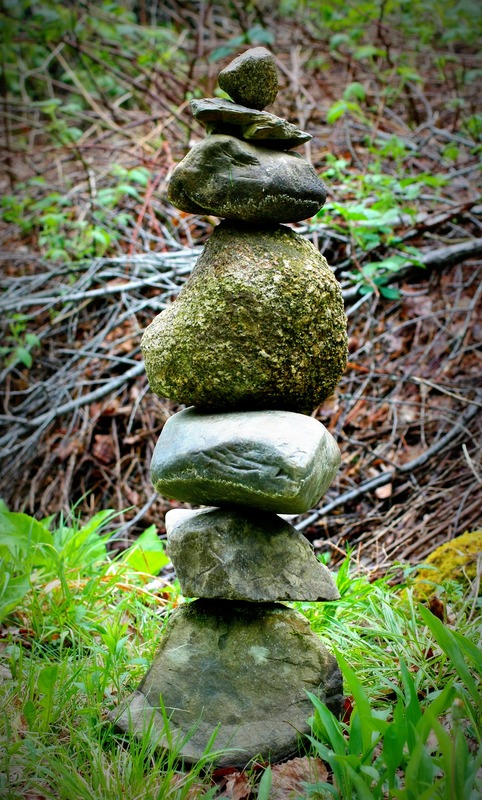 Be playful and le t go of your expectations about how it should work (the rocks fitting together) or how the coaching session should go. Don’t expect perfection, and take “failures” as an opportunity to rebuild differently. Playfulness includes being curious. How about this or how about that? What if? Curiosity begets better questions. Get quiet. Allow for periods of silence, even though it may feel uncomfortable, so there is space in the coaching conversation for the client’s own thought process to continue and insight to gradually emerge on it’s own. Stop interrupting the flow because you feel the need to say something. We do not need to fill all the quiet spaces…leave room for what bubbles up. Slow down. It’s really part of being present and allowing for silence. Whether you watch my video or just read this and look at the photos of some of my creations, I hope you will enjoy a meditative few minutes. I am fortunate to have this space in my life to share with you. PS: If you click on the photos in this blog they will open up to larger windows for better viewing.